Low prices. OrangeSmile.com offers car hire service in Slovakia on the lowest-rate-guarantee basis, since we work with car suppliers directly. For your search criteria in Slovakia, we always select and show the best rental offers. The car reservation process consists of 3 simple steps: (1) search for available cars for your dates in Slovakia; (2) select your car type; and (3) fill in the booking forms. Once the reservation is completed, you will receive a confirmation voucher to your email address. During the booking process, please check your rental conditions. To pick up your car at the rental point in Slovakia, you need to provide our confirmation voucher, your driving license and a valid credit card. The final payment is normally carried out at the pick-up point. Our car hire points in Slovakia accept VISA, MasterCard, etc - please check your rental conditions. At the pick-up point, please read the handling manual and check the car for present defects. OrangeSmile.com wishes you a pleasant journey to Slovakia! The car hire reservation system OrangeSmile.com allows renting a vehicle in Slovakia within 10 minutes. Our largest database of car suppliers enables us to provide you a rental car in Slovakia at the cheapest rate ever possible. At rental locations in Slovakia we offer the following car sizes: mini, compact, economy, standard, premium and luxury. The following car types are available in Slovakia: Sedan, Hatchback, Jeep, Cabriolet, Coupe, Minivan and Minibus. 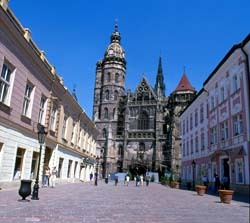 Magnificent churches remain the most famous landmarks of Kosice. The central street of the city is the location of St. Elisabeth Cathedral - the largest church in the country. The height of the main tower, which was built in the 11th century, is 59 metres. Beautiful gothic altar decorated with skillfully made drawings remains one of the most precious artifacts of the church. In the 15th century, St. Michael's Chapel was built near the cathedral. Inner premises of the chapel are no less interesting than its outer design as there are beautiful drawings and frescos that depict important historic events. Until the middle of the 18th century, a graveyard was located near the chapel. Later the graveyard was turned into a park. If you need to take or to return a car at night, it is better to search for a vehicle in airport locations (downtown offices in Slovakia usually do not work at night). Before making a reservation, please read the rental conditions of your chosen car. This will help to avoid unpleasant surprises at the rental office in Slovakia.